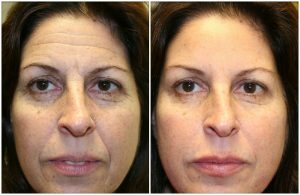 This facial is perfect for 30 to 50-year olds, who may suffer from youthful skin troubles, such as clogged pores and breakouts or even ADULT ACNE. This treatment uses exfoliation, extractions of whiteheads and blackheads, and a LINIA luxury facial mask to help clear out your pores and bring your skin back into balance. We also will be using the intense pulse light technology depending on your Fitzpatrick skin type to help speed up the process. This is Ideal as a monthly facial to drain impurities and keep your young skin looking fresh and ready for anything. Does this treatment have any down time? This treatment has 12 hours down time and for up to 14 days you will have to stay out of direct sun! But luckily, we got you covered! With our Alumier post procedure kit that includes a factor 40 sun protection, purifying cleanser to remove impurities and a luxury lavender facial balm, to help soothe and heal the skin. How many treatments will I need to see and improvement? This varies person to person as everyone’s individual needs are different. We advise to start with 3 treatments and see how you progress.